The social media has changed the way people look at life. This is not just true in personal life but also in professional life. Most recruiters today conduct background checks by reviewing LinkedIn and Facebook. LinkedIn presents your professional identity to the world. 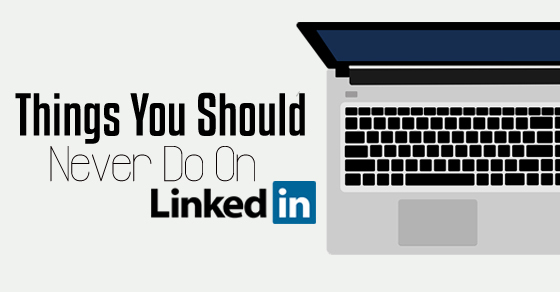 While it is definitely good, it also means you need to be extra careful while using your LinkedIn profile. LinkedIn is one of the most widely used social networking sites among working professionals. From improving your professional networking to looking for new jobs, LinkedIn offers professionals with a perfect platform to perform all these activities smoothly. However, to create a good impression in the minds of prospective employers, you need to be very particular about your activities on LinkedIn. What not to do on LinkedIn? You may be tempted to hide all the flaws in your career chart, especially in your LinkedIn profile. Many times, your friends and near and dear ones also visit the LinkedIn profile and you may wish to maintain it clean. Yet, it is best not to lie on your LinkedIn profile. It can affect your online reputation and may even cause you to lose a good job opportunity. Prospective employers often make it a point to check the LinkedIn profiles of prospective candidates. If they find a mismatch in your employment records in previous organizations in your LinkedIn profile and resume, then it will be an embarrassing situation for you. Therefore, avoid lying. Mention everything truthfully. It may bring you fewer opportunities but the ones you really deserve. It is true that LinkedIn is a social networking website but unlike others, it maintains a professional reputation. You need to retain the same when you are interacting on LinkedIn. It is not the place where you can complain about your daily routine, argue with people or share something which you are not likely to discuss with your co-workers. Your posts in a great way create a perception in people’s minds about you. LinkedIn should be used to highlight your professional achievements, work experience and your skills only. You may use it to advertise your skills and knowledge. If you are a writer, share links to your blogs. If you are an SEO person, share your comments and opinions regarding changes in SEO strategies after each Google update. If you are an artist, speak up regarding the latest artwork. This way, you will gain reputation in the desired circles. It will help you enhance your career profile. Just like there is a positive side to every new change, there are sure equal negatives. One such drawback of the LinkedIn profile is that it may share trivial facts that may not be interesting to people around you. For instance, if you joined a new firm or shifted to a new place, it may not hold any significance to your professional contacts. Updates are often a nuisance on LinkedIn and need to be used only on appropriate occasions. So when you log into your profile, make it a point to turn off the updates section if you don’t want your connections to know about any change you have made to your profile. Yet another thing that you need to keep in mind is that you need to stay within the limits of a professional profile. In an attempt to make your LinkedIn profile, do not overdo the sharing as it may give you the reputation of a spammer and not a job seeker or a professional. The use of an inappropriate photo on your LinkedIn profile can have a negative impact on your career growth. You may feel great to share your pictures of trekking which you took during your summer holiday. However, your colleagues and potential employers may not share the same level of enthusiasm. You need to maintain a professional reputation on LinkedIn and this means you share images that reveal your professional side. Do not share images with your kids in some park as it gives you a totally different image. It may even hamper your career prospects. One major problem with LinkedIn is that it offers users with the opportunity to send invitations to contacts who are not on LinkedIn. It also enables users to invite non-LinkedIn members to join their service. It can be quite confusing to find out the difference between both options when you come across them on the same list or side by side. Though you are not doing any harm by requesting your co-workers to join LinkedIn, you need to be selective about sending invitations. You must see whether the profile on this professional social networking site will benefit your colleague or not. If he finds it a botheration, he may simply block you from all social profiles. This can actually hamper your professional relationship. So be choosy and select invites to people who will appreciate it and take it in the right sense. This is one thing that irritates many people. They are likely to reject your invitation if you state that both of you are friends. Therefore, avoid trying to connect with unknown people with whom you have not worked with before or you don’t know personally. It will save a valuable amount of your time. There are chances that you may encounter the same person some day in your professional life and a negative image about you may make you lose an opportunity. If there are people on LinkedIn who wish to add but whom you do not know personally, it would be wiser on your part to send them a message. Tell them why you wish to add them and they may consider adding you. This way, you won’t create a negative image of yourself. Don’t send the same message to a couple of people. It may happen that while you send important messages meant for your co-workers on LinkedIn, you end up sending it to someone whom you do not know personally. This will create unnecessary confusion and the whole process of your communication will go haywire as a result. Thus, you must take time to read a person’s professional profile. Once you are convinced that you know the person, you can add him or send an invite. This will also prevent sharing your information with someone who is not known to you. In a world with rising crime rates, you must be choosy while sharing information about yourself. Keep one thing in mind, LinkedIn is a networking site only meant for professional networking between people and not between people and firms. Your individual profile should reflect your true status as a professional. There is sure scope to advance a business by making pages related to your company. There is a separate section on LinkedIn where you can add details such as the logo of your company and overview which is known as Company Pages. You can add all these details on that specific section of your profile and give it the necessary professional look that it deserves. Though LinkedIn was specifically created as a business networking tool, none of your connections would like to find you constantly talk either about yourself as a professional or about your firm. Occasionally doing so is appropriate. As in the case of other social networking sites, sharing information you come across is a good thing to do, even if you do not create it yourself. However, always make it a point to credit the source from where you derived the information. Be wise with your choice of words while communicating with other professionals. Do not boast or speak things that you are not actually capable of. You do not need to interact continually on these sites. You just need to make sure that you are reliable and posses a good reputation. LinkedIn has the option of endorsing friends and connections for certain skills. This option helps others know what skills you are good at. This is true but you should not tell anyone to endorse you for a certain skill. People should do this all by themselves after knowing you and working with you. Coaxing someone to endorse you for some skill, he is not sure you are good at, can actually harm his and your reputation. Unlike other social networking sites, this site means business and you need to maintain that attitude. LinkedIn acts as a great platform for beginners in their career. Misuse of this site will harm your repute and so use this platform wisely.